Request a Free Gold Shipping Pack Today! Complete the simple form on the bottomright side of this page. Your Pack will be shipped today. "I think you guys are wonderful. You are very reliable company, someone I have come to trust Immensely, and will continue doing business with you." "This is the third time I've sent precious metals for evaluation-each time the response and check are prompt and I've always been most satisfied with their fair offers." "I am very pleased with the courtesy shown. The offer was more than I anticipated and payment was received promptly-will definitely recommend to others!" "I was nervous at first to just ship off my gold, however, within days I received a notice of their offer and it was extremely generous and reasonable, better than any offer I had gotten locally. It was a pleasure doing business with them and I will certainly use them again in the future." "Very fast and helpful. Highly recommend them. Thank you "
"My experience with NationalGoldBuying.com was nothing short of spectacular. The process from the beginning was very professional and prompt. I received my appraisal back very quickly and was honestly blow away by the amount that I was offered to me for my jewelry. I highly recommend this site. " "This was so easy! They mailed me the whole packet and I just dropped it off. They called me to see if I needed help and then sent my offer very promptly. I definitely recommend it!" "Quick, easy service that provides the maximum return I've seen on the market. So easy, even a caveman could do it! Lol"
"Wow, very fast evaluation and immediate payment for almost double what I expected. Many thanks." "Had a fast and very good experience. I sent a small bag of broken gold and sterling jewelry pieces and received twice the amount I was offered at a local buyer. National Gold was easy and provided ongoing communication with a rapid payment. I will use them again and highly recommend"
"I have used NGB twice and ,as always, the NGB team was very amicable and accessible. The process is very simple and free, their offers were fair, and their payments arrived very fast. They have my stamp of approval!" "Great service, fast, fair and a real pleasure to deal with. Great customer service and I am recommending to anyone who asks!!!!" "I sent my old silver jewelry to 3 different companies to see which would give me the best offer so that I would know which company to send my old gold. This company gave a favorable offer and I was pleased with the check that I received in a very timely manner." "I wasn't sure about selling my jewelry online, so I did some research and this company was highly recommended. Took a chance, and was very happy I chose them. Not only did they give me a very fair price for my jewelry, but were prompt in remitting the payment. When I had a question, they called back immediately and were so professional. I would highly recommend using them if you have unwanted jewelry or need immediate cash for what you need to sell. They were great." "My experience was very positive. I had a bunch of jewelry laying around collecting dust and knew there had to be an easy way to get rid of it. The pre-paid envelope came in the mail super quick. The packing process was easy and I dropped it to FedEx. The very next day, I got an email that said they received the package and were evaluating and within hours I received a quote. I honestly was not expecting much, and the quote was higher than I anticipated. The check arrived within a few day. The communication process was super and I will definitely use this service again. " 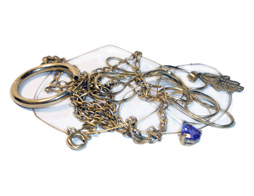 We will Rush you a FREE pack including an Insured PREPAID return envelope for your jewelry. Free Valuation of your gold, silver or platinum jewelry. Simply fill out the form above and we'll send you everything you need to find out what it's worth. Deal direct with the refiner. Our valuation service is FREE! If you are not satisfied with our offer, we will return your materials to you quickly and at NO Charge.